It’s April Fools’ Day. Delay reading this post at your peril. I have previously written about Bill Wakefield, Sidd Finch and Bruce Springsteen. It’s time to connect the dots. This post is a little shorter than normal, so TL;DR should not be applicable (for those who don’t recall, that’s editor shorthand for too long; didn’t read). Mets Spring Training 1966 – A #42 Story: As noted in Hot Stove #91, new Hall of Famer Mariano Rivera was the last player to wear #42. After Rivera retired in 2013, Jackie Robinson’s number was deemed retired by all MLB teams. This prompted some reminiscing from Kansas City native Bill Wakefield. Wakefield was signed by the Cardinals in 1960 and played three years in their minor league system. He was traded to the Mets where he played his only major league season, pitching in 62 games in 1964. He returned to the minors in 1965. The Mets invited him to spring training in 1966, and it turned out to be a special experience. First and foremost, he was assigned uniform #42. The cast of characters at that spring training was memorable. Casey Stengel, Wake’s manager in 1964, was in camp as a consultant. Yogi Berra caught spring training games. Warren Spahn was the pitching coach. Jesse Owens was the running coach. Wake had breakfast with Ralph Kiner. Rookie Nolan Ryan was preparing to pitch his first MLB season. The team played in the former Yankees spring training facility on Huggins-Stengel Field. Miller Huggins was the Yankees manager during much of the Ruth era. Each person named in this paragraph (well, not Wake) is in the Hall of Fame. Mostly Cooperstown, but Jesse Owens is in the National Track & Field Hall of Fame. 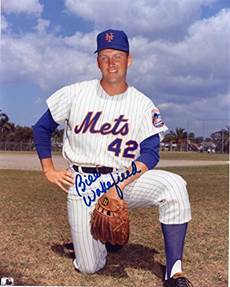 Mets Spring Training 1985 – A #21 Story: Bill Wakefield’s memorable Mets spring training leads me to another story about a Mets spring training, this one in 1985. It also involves a right-handed pitcher, but wearing #21, exactly one-half of the Jackie Robinson/Bill Wakefield number. The uniform number has no significance to this story. Just showing that some of the math I got in engineering school has not left me. Finch was 28 and had never played professional baseball. A Mets minor league manager had seen Finch throw and urged the Mets to give him a tryout. Finch was sort of a recluse and not sure if he wanted to play baseball. Finch had a gifted arm that greatly impressed the Mets and so they were willing to work with his eccentricities. Finch desired privacy and so worked out at a remote area and did not stay in the team hotel. He had workouts with three of the Mets, including Lenny Dykstra, and he worked with pitching coach Mel Stottlemyre. The big thing was the Finch fastball that had radar gun numbers that made the Mets salivate. He was Nolan Ryan plus. And he had great control. The mostly private workouts were also attended by Mets chairman Nelson Doubleday and GM Frank Cashen. They liked what they saw. To keep their deal with Finch, the Mets were reluctant to talk about him until he made a decision to play. Plimpton proved resourceful in getting background material. Finch had been enrolled for a short time at Harvard, and Plimpton was able to talk to his roommate who confirmed the Zen-like nature of Finch who had studied in Tibet. 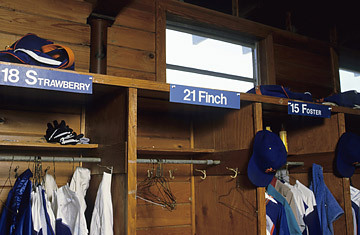 Although the Mets had tried to impress Finch by assigning him a cubicle between stars George Foster and Darryl Strawberry, Finch kept away from the clubhouse and spent most of his non-baseball time at his boarding house (as his landlady confirmed to Plimpton, saying Finch practiced on his French horn at night). After Plimpton’s article came out, Mets fans screamed for more on Finch. The New York papers complained about Plimpton getting the scoop in Sports Illustrated. The Mets finally agreed to a press conference in St. Petersburg. The major TV networks attended, as well as some reporters. Finch was there with a prepared statement, but it was read on his behalf by someone else. The statement announced that Finch was retiring and would not be playing baseball. Where is Sidd Finch Today? 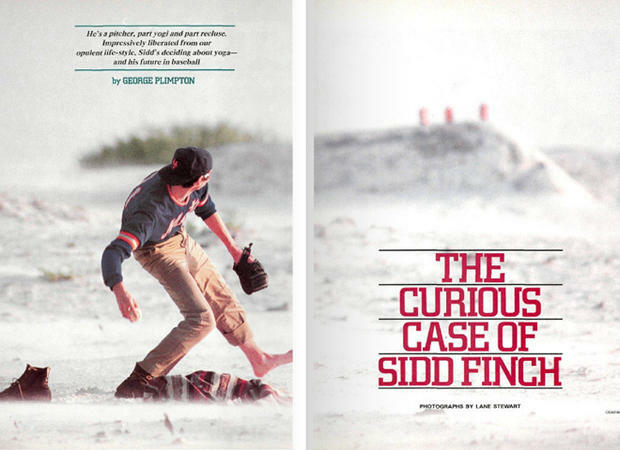 Many questions were raised after Sidd’s retirement, and Sports Illustrated answered by pointing out the date of the Finch issue. It was April 1. Plimpton and Sports Illustrated had pulled off one of the best April Fools’ jokes of all time. There was a hint in the subtitle of the article (see photo below): “He’s a pitcher, part yogi and part recluse. Impressively liberated from our opulent life-style. Sidd’s deciding about yoga – and his future in baseball.” When you take the first letter of each word of this subtitle, it spells “Happy April Fool’s Day – a(h) fib.” Another hint from that photo might have been that Finch pitched with one foot bare and one in a hiking boot. April Fools’ Day: Just like the date of Plimpton’s SI article, the date of this post is no accident. And in honor of George Plimpton, I’m going into the background of how his hoax was put together. What you will be reading below is about 97% fact-based. Some tiny part will be your April Fools’ takeaway for today. I’ll let you know that part at the end. No peeking. Behind the Scenes with Plimpton: George Plimpton and Sports Illustrated assembled a cast of many characters to pull off the hoax. To find a major league team to participate, Plimpton turned to his book publisher Doubleday. The company owned the Mets, and its CEO Nelson Doubleday was also chairman of the Mets. Doubleday gave the green light to GM Frank Cashen who assigned publicity director Jay Horwitz to deal with the press and organize the setup at training camp. Several Mets players were involved, some unknowingly. SI photographer Lane Stewart recruited his friend Joe Berton, a high school teacher, to pose as Finch for the photos. Manager Davey Johnson parried questions from the press about his potential new ace. 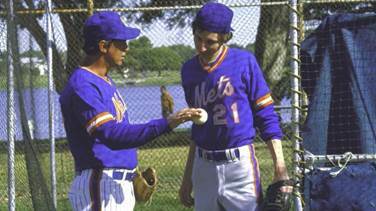 Below, coach Mel Stottlemyre gives pitching tips to Sidd (Berton). Lonnie’s Jukebox: Springsteen put the finishing touches on the song and it became a track on his Born in the U.S.A. album released in 1984. 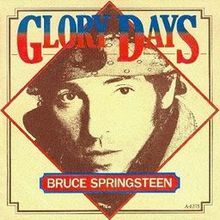 The single of “Glory Days” was released in 1985, in the spring, as in spring training. The baseball theme carried through to the sleeve for the single (note the diamond). The single of “Glory Days” was released soon after the Finch story came out and was on the Billboard pop chart for 18 weeks, peaking at #5. Finch of course never had the occasion to actually use his walk-up song. But Plimpton proved prescient in establishing one for a fictional pitcher. Four years later, in the movie Major League, Rick Vaughn (played by Charlie Sheen) is a pitcher with a fastball like Sidd Finch, but lacking Sidd’s control. So his apt walk-up song is “Wild Thing,” and the crowd response as he walks to the mound makes for a memorable movie clip – click here (1 minute). Music note: It’s not the popular 1966 Troggs version, but a 1984 cover by punk band X. 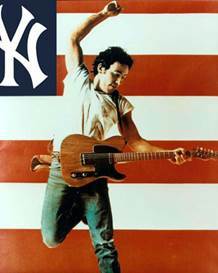 Over the years, Springsteen tracks have been used as walk-up songs. Some examples: “Glory Days” for Twins pitcher Addison Reed; “Better Days” for Hall of Famer Paul Molitor; and “Badlands” for Giants pitcher Jake Peavy. The current song list on the MLB website does not show a walk-up song for the Royals speedy Terrance Gore. Maybe that’s because he rarely bats, but I’m thinking Springsteen’s “Born to Run” should be played when Gore comes in as a pinch runner. ESPN “30 for 30” Short: The Sidd Finch “behind the scenes” story is well documented in an ESPN “30 for 30” short. It premiered in April of 2015, the 30th anniversary of the SI article, and for a while works as its own April Fools’ joke. It starts off with a narrative by NYT sportswriter George Vecsey describing the Mets ups and downs since their founding in 1962. 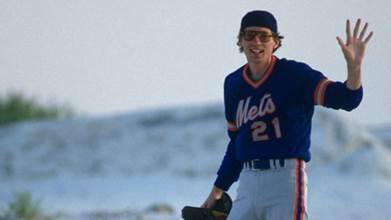 As 1985 approached, the Mets looked strong, and that optimism helped fuel the Sidd Finch fever. The ESPN video includes interviews with Plimpton, Springsteen, Stottlemyre, Mets staff, Finch (Joe Berton), photographer Lane Stewart and participants from the Sports Illustrated publishing staff. For those with that kind of free time, click here to watch the video (22.5 minutes). Springsteen Follow-Up: Rita and I have some audience history with The Boss. We were among the 17,000 fans at Sprint Arena in 2008 for one of Springsteen’s legendary concerts. Last year, we luckily scored tickets to his one-man Broadway show that played to a nightly audience of 948 over a 236-show run. The theatrical production was mostly talking, partly singing, as Bruce reflected on his work and life, backing up his songs with a piano and acoustic guitar. The setlist included three songs from his Born in the U.S.A. album, but alas, not “Glory Days.” I was hoping he would do that one and give a shout-out to Sidd Finch. I wish I had the opportunity to ask him why he did not do that. The Reveal: Well, I don’t really need to ask Bruce the question. If I had that opportunity, he would look at me quizzically and say “What the hell are you talking about?” You see, “Glory Days” has nothing to do with Sidd Finch. Bruce was referring to a real person, Joe DePugh, his little league teammate in 1973. I have no idea if Bruce ever met the late George Plimpton. Other than that, most of what you read above is true. I did hedge on the date Plimpton started work on the project. It was early 1985, but I backdated that to 1984 to match up with the release date of the album Born in the U.S.A. The lyrics, release date and Billboard charting for the single of “Glory Days” are all correct. 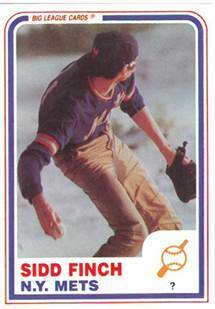 The baseball videos for the song are real, but if you watched the second one, you did not see a Sidd Finch card. The “behind the scenes” work not involving Springsteen reflect how it really happened. For the record, everything I said about Bill Wakefield is true. There was one clue that was likely picked by Springsteen fans. Bruce does have a “love of New York baseball” as I wrote above. But I left out a key word in that quote. Bruce, just like the devil in Broadway’s Damn Yankees, is a diehard Yankees fan. Not. The. Mets. Behind the Scenes at Hot Stove: As always, my editor Rita was most helpful. The Finch/Springsteen connection was pure serendipity. My plan was to do the brief summary of the Finch story, talk about how it was put together, and then spin a record from that era on Lonnie’s Jukebox. So I scrolled through the Billboard charts to find a good song from the spring of 1985. I checked out a few and ran across the John Sayles video for “Glory Days.” The baseball opening in that video got my attention and reminded me that “Glory Days” is often played at stadiums. I admit I did not remember the specific lyrics (other than the rousing “glory days” refrain), but upon checking, there was a gem in the very first verse – that “speedball” pitcher – just like Sidd Finch. Bingo!